Kampala is Uganda's largest city and its chief urban centre, known for its friendly, welcoming people, and beautiful setting. 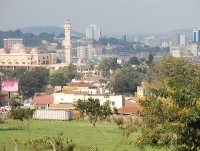 The city is built over seven hills, and stretches to the shores of Lake Victoria. While the buildings and other vestiges of urban infrastructure may still have a ramshackle quality and an air of neglect about them, aspects of the city are booming. Tourism, and the presence of NGOs, has brought new money and fresh ideas to Kampala, reflected in the diverse international cuisine, burgeoning local art scene, broadband Internet facilities, and inevitably, the increasing number of traffic jams to be found there. Many visitors come overland from Kenya, and find Kampala's relaxed air and reputation for safety a welcome relief from the (comparative) hazards of Nairobi. Perhaps the biggest danger facing tourists to Uganda's capital are the Boda-boda motorcycle taxis - these should not be used, unless the intrepid explorer has a burning desire to add the inside of a hospital room to their Kampala itinerary. There is little in the way of must-see attractions in Kampala itself: a former key site, the Kasubi Tombs, was extensively damaged by fire in 2009, and remains closed; while the Uganda National Museum is a pleasant afternoon diversion at best. The Uganda Railway Station building is worth a look, as it remains a wonderful example of grand colonial architecture. Some of the most appealing experiences are to be had in the city's vibrant markets. Owino market is a famously chaotic and eclectic place, with everything from original artworks to charity clothing for sale. The smaller Nakasero fresh-food market is very colourful, with fruit and vegetables from all over the region for sale, much of it unfamiliar to western eyes (and palates). For arts and crafts, the roadside market on Buganda Road rewards those with a keen eye, and robust bargaining skills. Kampala is typically used as a base by visitors, who are en route to the one of the great natural attractions found in its outlying areas. The most popular of these is undoubtedly the gorilla-viewing experience at Bwindi National Park, closely followed by wild chimpanzee feeding at Ngamba Island near Entebbe. The nearby Nile River also offers numerous activities: rafting and jet-skiing in the headwaters is an exhilarating experience, while an excursion or weekend trip to the Ssese Islands is also well worth the time. We are looking for contributors for our Kampala travel guide. If you are a local, a regular traveller to Kampala or a travel professional with time to contribute and answer occasional forum questions, please contact us.